Natural Physique has recently taken on the training and nutrition of dressage champion Sofie Butchart. Sofie approached me to help with her nutrition for the competition year ahead and I also persuaded her to let me help her with resistance training which she was excited about! We are training at Muscle Limit Gym twice a week when she can and Sofie is already making great progress! Sofie Training Hard at Muscle Limit Gym. Check here at Natural Physique and my Instagram (@Chownie1) for progress updates. Check out Sofie's Instagram @sofiebutchartdressage and website www.sofiebutchartdressage.co.uk . Mr Natural Universe? My life? What was the mindset that I had to achieve what I have achieved in natural bodybuilding? Hey, its no secret, it was just the way I lived my life! But none the less I am more than happy to share with you my 'secrets'. I started competing as a natural bodybuilder in 1991 after 2 and a half years of training and over the years have won several Under 21 Junior titles including the Junior Mr Britain and Junior Mr Europe. Later on in my career my achievements extending to winning the INBF World Heavyweight tile in 2005 in NYC and a year later winning the heavyweight title and overall champion at the INBA Natural Mr Universe in Los Angeles, California where I earned my natural bodybuilding professional status. Plenty of moments I will remember for the rest of my life. 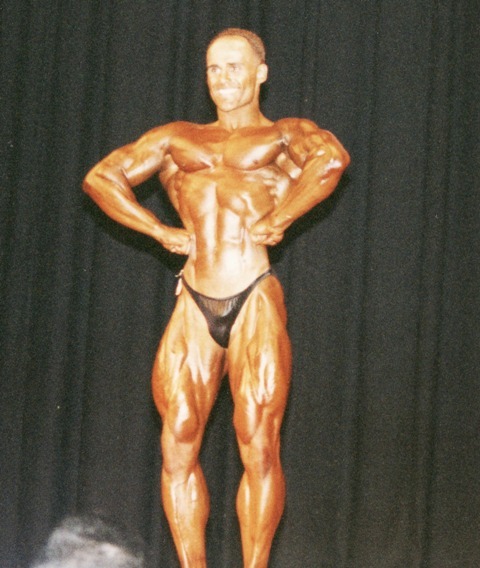 ANB SOUTH EAST AGE 23, WINNING THE HEAVYWEIGHT CLASS AND OVERALL IN 1996. Getting yourself into the mindset to train for a bodybuilding competition can be hard! You know you have many weeks, or even months if you have more than one competition lined up, of hard dieting, hard training, 24 hour commitment, tiredness. What the hell made me want to do this?! Well, it is a sport I love and luckily for me its a sport that I was encouraged to compete in from early on in my training as I was actually good at it! I'm not very good at many things so this was my opportunity to excel in a sport. When I'm passionate about something my drive towards my goals is intense. Even before I started training I knew I wanted to be a bodybuilder, I wanted to win the Junior Mr Britain title, to be one of the best in the world. One other thing that drove me as well was that I was scared of losing! I wanted to win, I wanted to feel special, I wanted to inspire others to build a body that they want, if I can do it then so can others. I was a very shy teenager, I worked in retail where you get many customers look down at you, I wanted to prove that with drive, determination, consistency that this shy teenager in a dead end job could work hard and become a World Heavyweight Champion, a Mr Universe, who could train in Golds Gym in Venice California and be recognised for the physique he built. What else drove me to have this intense mindset? It was seeing how much the body can take in the gym, as I have always been lifetime natural I didn't have the option of drugs helping me build my physique. I didn't want to limit myself either with the mindset that as I was natural then I'm limited to only building a smaller physique, a physique that could only lift a limited amount of weight. My goal was to build a physique that wouldn't of looked out of place amongst 1980's style physiques, as to me this was one of the best eras of bodybuilding. If I told myself that I can't do this because I'm natural, I can't do that because I'm natural then I would limit myself to what I could achieve. I was a bodybuilder, thats it. I trained harder than anyone else, I was known for crazy intense training sessions, especially leg workouts. I got the respect of high ranking non natural competitive bodybuilders. It's amazing how much punishment the human body can take. I'm not saying this is the way for everyone to train as everyones goals are different, but this was my mindset, every workout was a challenge, I trained intelligently, but like a nutter too! A massive tool that helped me too was visualisation. I'll cover this inmate depth in a separate blog another time. In my mind I had what I wanted my body to look like. Every workout I trained my body, I could 'see' the fibres contracting, the muscle growing. My body just had grow into what was in my mind. Every time I ate a meal, every gram of protein was building my body, every step of cardio pre contest was turning my body into a fat burning furnace. Visualisation really works! One other thing that is really important, and something I learned later in my competitive career is a balance in life. Even though I was very intense with it all I learnt to switch off as well. Pre contest I still made time for others in my life, not early in my career, but the last few years I did. In the early years I thought everyone should understand what I was going through. I didn't make much time for others pre contest. It was when an ex of mine competed I found it really hard to be the partner who wasn't competing, not going out, the arguments. This was coming from someone like me who had competed several times! I thought if I found it hard then what must people think who aren't into the sport who's other half is competing, it must be hell! From then on when I competed I always made time to do things with my other half, no matter how tired I was, my cool bag can come with me and we can have days out. It helped and I then had more of a balance, certainly not perfect, I did have competitions coming up but I made the effort. Now when competitors tell me their husbands or wives don't understand, its causing problems in their relationship, I can help. Competing certainly isn't worth losing a great relationship over and no-one forces us to go through this, we can stop at anytime. This sport isn't for everyone, I've seen many people diet for a show and they've suffered badly mentally, they just haven't got the right mindset, they're almost losing their mind, they get angry with everyone, ranting, its really not worth it. Competing should be fun, seriously hard, but fun seeing the changes your body can make with hard work. If its not fun then take another sport or activity up, life too short! Anyway, I waffled on enough I think but I'll cover more on mindset, visualisation etc. in the future. If you have anything you'd like me to cover then just let me know!